Each year during Black History Month, I think about my social studies teacher Miss Rankin, who dragged an entire class of grade school students through worthless work while ignoring the truly important "social studies" going on beyond our schoolhouse walls. This was the 1960s, when thousands of courageous North Carolinians were actively engaged in the struggle for civil rights, reshaping the community around us and creating the world we would grow up to live in. But the students in Miss Rankin's class never talked about it. Instead, we students were absorbed in memorizing the names and county seats of the 100 counties of North Carolina, taking a test in which we had to place each name accurately on a blank paper map, and then neatly coloring the boundaries for bulletin board display. In this way, Miss Rankin intended to teach us the story of our state. What we actually learned from this exercise was that we must go along if we want to get ahead. What we did not learn was that American values and constitutional commitments made the struggle for civil rights imperative. We didn't learn the five freedoms of the First Amendment, all of which made this struggle possible. And we also did not learn to do what all good citizens must do: pay attention to the world outside and think, consider, dig deep, connect the dots. If Miss Rankin were still teaching today, she would not be able to isolate us from current events, of course, because youth have access to a constant stream of news - independent of their teachers or their parents. 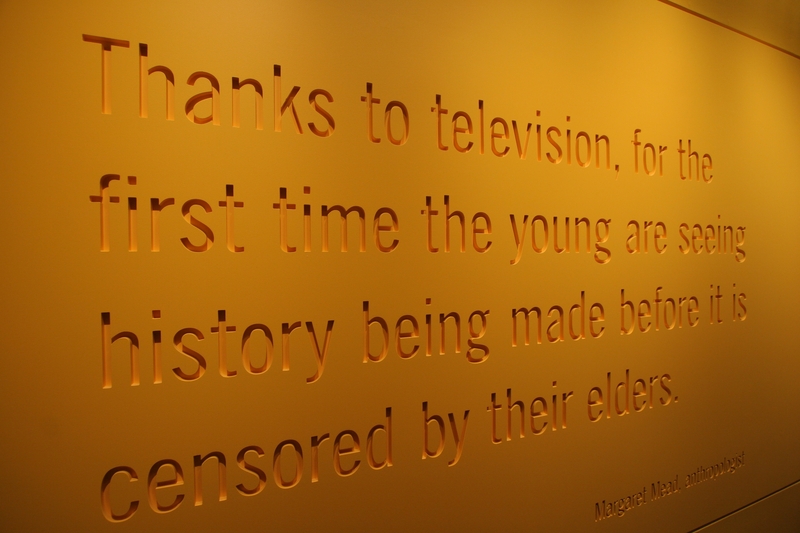 One famous lifelong student of social studies, cultural anthropologist Margaret Mead, put it in big-picture terms: "Thanks to television, for the first time the young are seeing history being made before it is censored by their elders." Decades after Margaret Mead's death (and Miss Rankin's retirement), television remains our primary source of news, whether we get it on TV sets or online via laptops, tablets, mobile devices. According to the Kaiser Family Foundation, 64 percent of young people aged 8 - 18 say that the television is usually on in their homes during meals, and 45 percent say it is left on "most of the time," even if no one is watching. The Foundation also reports that 59 percent of youth's TV-viewing consists of live TV on a TV set, and 41 percent is time-shifted, DVDs, online, or mobile. Pew Research cites Nielsen data demonstrating that 71 percent of adults in the U.S. watch local television news and 65 percent view network newscasts. Those who spend the most time with broadcast news are the 38 percent of adults who watch cable. Seeing history being made on television today is not unlike watching the proverbial sausage being made -- watching a stream of incremental and disjointed bits of the bad and the good, the heroic and the shameful, the inspiring and the ridiculous. And in this intensely negative political season (dominated by what Michael Gerson recently called "the middle finger politics of Donald Trump," when sound bites fill the airways "with views and tactics we would never teach our children") we are exposed not only to information, but to values and attitudes that are as confounding as they are jarring. To cope, we develop habits of collective skimming and denial. How many of us are digging deep to the stories behind the headlines these days? I'd like to believe that #Election2016 will be over someday soon, and that our favorite news reporters, photojournalists, and commentators will drop their obsession with presidential primary politics and become our social studies teachers and coaches once again. Here are three hopeful examples that pertain to issues shaping our communities. •	Criminal Justice. The Center for Investigative Reporting has launched "StoryWorks," a project that positions journalists to partner with actors in bringing real news stories to the stage, engaging the audience in the complexities of a story and allowing them to dialogue with the performers, producers, and subjects of the stories in a "TalkBack" session after the show. Recent performances brought stories of crime, homelessness, abuse, and justice off the page and into a three-dimensional theater-based experience. •	Economic Justice. The Washington Post's Terrance McCoy won a 2016 Polk Award for his reporting on "structured settlements," such as the one that left Baltimore plaintiff Freddie Gray with "pennies on the dollar" of what he had been awarded as a victim of lead-poisoning when a child. Many are familiar with the headlines about Freddie Gray's death in police custody last year, but McCoy went beyond the original story to uncover unscrupulous practices that prey on individuals already socially and economically disadvantaged. In follow-up, the state of Maryland is investigating, and we may hope that there will be more in-depth reporting to follow. •	Freedom and National Security. In March, the Newseum Institute will launch a new project designed to equip teachers at the middle, high school, and college levels with the tools they need to engage students in in-depth learning about events and issues that challenge American society today. "Freedom in the Balance starts with the events and aftermath of the 2001 attacks, and then looks backwards and forwards to trace how debate about balancing freedom, security, and diversity have shaped our nation from its founding to current events." I've lost track of the other students in Miss Rankin's social studies class, but I would be interested to hear their reflections on our shared experience. Perhaps a few would agree with me: while we were busy memorizing all those counties, we missed some of the most important lessons of our day. But, hopefully, it's never too late to remediate. My big take-away is that to do so, we've got to get out from behind those little desks, into the big classroom that is the news, and do our best to get behind the stories.